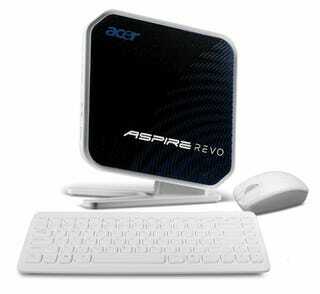 Acer's funky book-sized AspireRevo nettop just got a little better…and a touch pricier. This R3610-U9012 model has Windows 7, a dual-core Atom 330 processor, double the RAM (2GB), and full Ion graphics. It also keeps support for 1080p HDMI output. Apart from the addition of 802.11n Wi-Fi, other specs remain identical to the Windows XP, 1GB RAM, Atom 230 model that costs about $200 bucks. There's also a VESA attachment for mounting on the back of your flat panel monitor or TV.